Following a successful installation of a four monitor video wall at the GE Skelmersdale site, J. Tomlinson Limited approached Technical Display Ltd to assist in the design of Audio Visual systems for the refurbishment programme of the GE Groby Leicestershire site. The project had two distinct areas that needed Audio Visual presentation facilities and both had the need for flexible solutions to utilise the space available. Technical Display Systems Ltd, in conjunction with the main contractor, has just installed Audio Visual presentation systems at One Vision Housing Association’s new Liverpool HQ. The Boardroom has a dual presentation system. 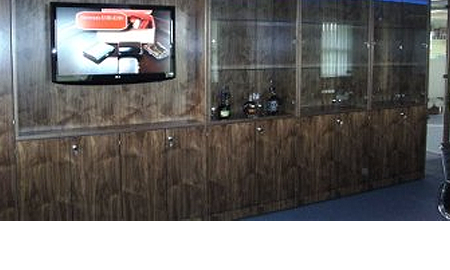 2 x 52″ Wall mounted LCD Screens can be used for either laptop, DVD or TV sources. Alternatively, a ceiling recessed projection screen can be lowered for larger screen presentations via a ceiling mounted projector. 2 x 46″ Samsung MagicInfo Digital Signage LCD Screens are located in the Restaurant with the additional facility for laptop, DVD or TV presentations. Again, as with the Boardroom, a ceiling recessed projection screen and projector can be used for large screen presentations. There are 7 meeting and training rooms all fitted out with 52″ LCD presentation screens, all capable of multi-media presentations from laptops, DVD or TV. All rooms have LAN connectivity. Technical Display had continual pre-install liaison with the OVH, the Project Manager and main contractor to ensure that each room had a neat and tidy, easy to use system. 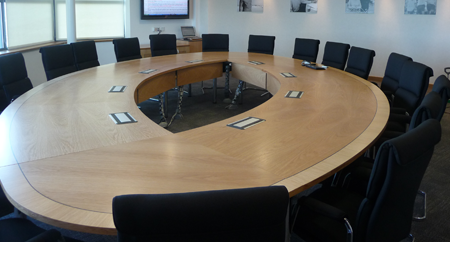 Technical Diaplsy worked together with Kirklees Council, their Architect’s Aedas building Consultancy, and main Contractor Strategic Team Group, to provide Audio Visual presentation facilities for the 3 beautifully, refurbished Ground Floor meeting rooms. In the 2nd phase of the refurbishment of key areas in the historic town hall, we were again asked to provide Audio Visual facilities for the large, 1st Floor Reception Room. As with the Ground Floor rooms, the state of the art facility had to have a seamless integration with original room décor and features. The room had to have flexible presentation facilities to accommodate varied uses. A large projection screen was needed, plus PA audio and audio mixing for live music concerts. Technical Display designed a wooden pelmet for the screen and projector enclosure to compliment room detail and features. A matching bespoke equipment credenza and mobile lectern give presenters full control of their presentations via an AMX control panel. 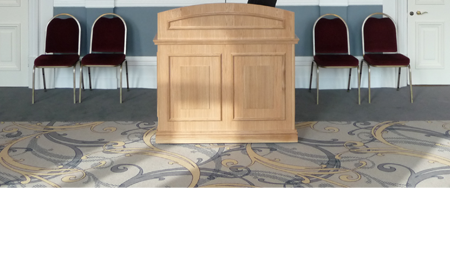 The lectern has an umbilical cord and is able to plug in at three points in the room to suit different room scenarios. Kirklees Council is outreaching to the public and the tasteful refurbishment of these areas is for the benefit of all the local community. There is an increasing healthy demand to book the rooms. Aqua-Mist Fire Protection is based in Wakefield, West Yorkshire, and has a team of expert personnel who can relate to every aspect of fire suppression. Due to continued, significant and sustained growth, Aqua-Mist Fire protection has recently moved into purpose built offices, where they commissioned Technical Display to provide their audio visual solution. Technical Display worked closely with the interior and design consultants to provide a solution that fitted in with the design scheme. 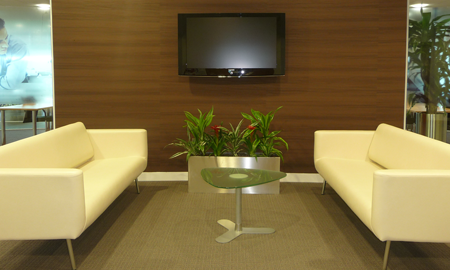 A fixed storage wall system, finished in walnut, was integrated within the Boardroom, and the audio visual equipment had to be sympathetically installed to complement the décor. Technical Display also installed a Digital Television Aerial System to feed 3 large screen displays that have built in Free-view channels. All the equipment was installed, tested and commissioned within the provided time scales.